Alphonse Island (www.alphonse-island.com) part of Blue Safari Seychelles (www.bluesafari.com) is a pristine, natural paradise in the Seychelles Archipelago, in the heart of the Indian Ocean. This private island, part of the Alphonse group of atolls, which includes St Francois and Bijoutier, is considered one of the purest natural idylls in the world. 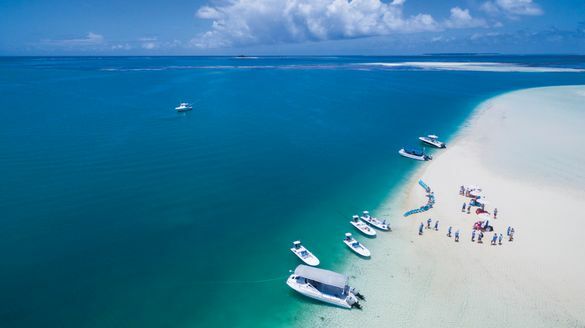 Beautiful white beaches line the edges of a lush tropical forest surrounded by miles of unblemished shorelines, lagoons, sea flats and protected coral reefs home to the vast array of wildlife that exists in this ecosystem. To celebrate opening all year-round so that guests can relax and indulge in this luxurious nature lover’s paradise anytime they wish, a special stay-seven-pay-five package will be available from the 1st May until the 30th September 2019. The seven-night package costs USD $5025pp full board, based on two people sharing a Beach Bungalow and also includes a generous array of activities and inter-island transfers. Alphonse Island is a 60-minute flight from Mahé, with flights departing every Saturday. Alphonse Island features 22 private Beach Bungalows and five Beach Suites, all overlooking the Indian Ocean. Beach Bungalows maximize the stunning surroundings, set amongst lush tropical plantation just metres from the beach. With outdoor showers, patios with gorgeous views, and the beach just steps away, the rooms are all focused on the surrounding natural beauty. The five one-bedroom Beach Suites are nestled amongst tropical plants, close to the white sandy beach. Discreet and luxurious, Beach Suites offer two bathrooms and a lounge area to give guests more space, as well as private plunge pools. Interiors reference Creole style and local materials, reflecting a sophisticated fresh island style of the 21st Century. Alphonse Island is also famous for being the best scuba-diving destination in the Seychelles with 30 dive sites surrounding the island rich with multiple marine species such as green turtles, eagle rays, nurse sharks and rainbow-hued tropical fish. This area is also an internationally renowned fly-fishing destination. Sustainability is the foundation of the Blue Safari Seychelles philosophy and all of the atolls and islands within the Blue Safari Seychelles portfolio are committed to the protection of the environment. Since September 2018, they are proud to be the first commercial Outer Island with a hospitality offering to rely on solar power and go completely ‘off-grid’. Designed to allow guests to reconnect with nature while respecting it, the Island Conservation Society (ICS) team offers activities to create an island that is intimately connected to the natural environment, which guests are encouraged to join. As part of the guided walks and Native Vegetation Restoration project, guests can choose to plant an endemic tree. Swimming with – and photographing – Manta Rays, is a particularly magical ocean experience, which helps capture important data about individual specimens and their movements. These islands provide important nesting grounds for our endemic Hawksbill and Green turtles; the turtle patrol and tracking project provides important insights into the population numbers and their movement, which helps the team protect them. Alphonse Island can only be described as paradise perfected, a destination where guests are at one with the environment, and now they can explore and relax all year round!